Design your own Tattoo There are 9 products. Create a custom temporary tattoo for your shoulder.Avaliable sizes: 4cm x 4cm, 5cm x 5cm, 6cm x 6cm, or 7cm x 7cmFor every tattoo bought, we send you a second one free. Press the CUSTOMIZATION botton to start desiging your own TTTattoo. Create a custom temporary tattoo for your fingers.Avaliable sizes 2x0,5cm & 3x0,7cmFor every tattoo bought, we send you a second one free. Press the CUSTOMIZATION botton to start designing your own TTTattoo. Create a custom temporary tattoo for your ankle Avaliable sizes: 4x5cm, 5x6cm, 6x7cm For every tattoo bought, we send you a second one free. 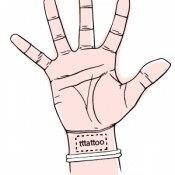 Press the CUSTOMIZATION botton to start designing your own TTTattoo. 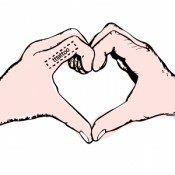 Create a custom temporary tattoo for your wrist. Avaliable sizes: 4x2cm, 5x3cm, 6x4cm & 7x5cm For every tattoo bought, we send you a second one free. Press the CUSTOMIZATION botton to start designing your own TTTattoo. Create a custom temporary tattoo for your lower-back. Avaliable sizes: 12x2,8cm & 13x3cm. For every tattoo bought, we send you a second one free. Press the CUSTOMIZATION botton to start designing your own TTTattoo. 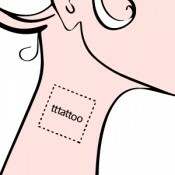 Create a custom temporary tattoo for your neck. Avaliable sizes: 2,5x2,5cm, 3,5x3,5cm, 4,5x4,5cm, 5,5x5,5cm For every tattoo bought, we send you a second one free. 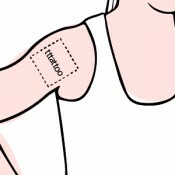 Press the CUSTOMIZATION botton to start designing your own TTTattoo.